By: James Proctor, Director of Professional Services, The Inteq Group, Inc. This post summarizes Inteq’s Business Process Capability Continuum™ and the waypoints along the continuum – from one end of the spectrum, organizations in the state of chaos, to the other end of the spectrum, organizations that are highly agile – and the key waypoints along the continuum from chaos to agility. This post also provides important guidance to help you identify where your organization (or functional area within your organization – department, division, business unit, etc.) is currently positioned along the continuum and provides key concepts and best practices in transitioning to the next waypoint along the continuum in the transformation towards agility. A detailed 12-page whitepaper can be downloaded here. 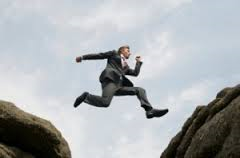 What do I mean by the “chasm” between business chaos and business agility? In order to understand the chasm, we first need to look at an organization in three layers and from 360°. 1. 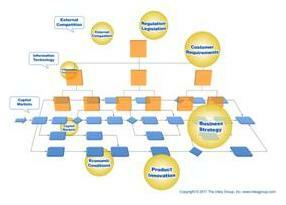 The Business Process / Workflow Layer: The work of an organization is performed via work activities (the blue rectangles) and work activities flow horizontally across the organization to create outputs for internal and external customers. 2. The Vertical / Managerial Layer: As the work flows horizontally across an organization from one work activity to another, each work activity is performed within a functional area (e.g. department, work group, etc. of an organization – the orange squares). 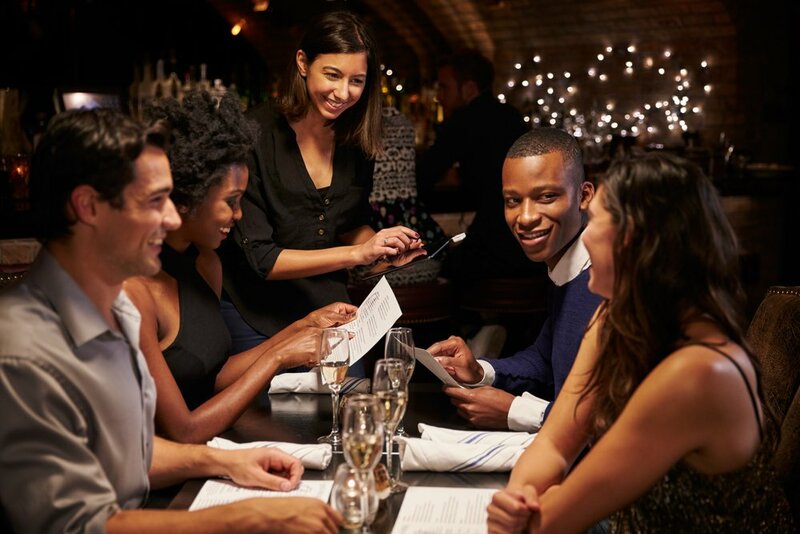 In other words, each work activity is performed by someone, each work activity is managed by someone, and that person is managed by someone and chain of management continues up the vertical reporting hierarchy. A key take away is that each work activity lives at the intersection of two coordinates – the horizontal workflow coordinate and the vertical hieratical reporting coordinate. Or, to put it another way, business value is created horizontally via work activities from a business process workflow perspective, but work activities are managed vertically from a hieratical managerial perspective. 3. The Strategic / Outward Facing Layer: As work flows horizontally and as work activities are managed vertically, all of this happens in a continually changing business environment with changing business rules and requirements. Organizations need to continually adapt to internal and external drivers of change (the gold orgs) such as changing customer requirements, product / product line innovation, competition, new regulations, new technologies, new strategies, changing economic conditions, etc. These drivers of change are continually changing as well. The chasm is the gap between the current “as-is” state of the organization vis-à-vis its horizontal work flows and vertical reporting relationships - and the optimal future state of the organization vis-à-vis the external change drivers. In other words, the more chaotic an organization’s business processes, the larger the gap, the more agile the organization’s business processes, the narrower the gap. 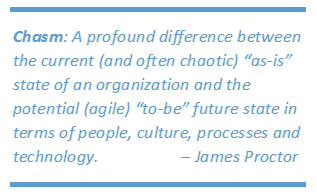 The chasm between the current “as-is” state and the optimal future state in most organizations is vast. As an organization moves through the various waypoints from chaos to agility, the gap narrows and the chasm becomes smaller – enabling the organization to be increasingly effective, efficient, scalable and competitive. The illustration below depicts Inteq’s Business Process Capability Continuum™ and the waypoints between the two notional ends of the spectrum – Chaos and Agility. It’s important to understand that there are infinite points in the spectrum between chaos and agility and that any organization (or functional areas of an organization) is currently positioned somewhere along the continuum’s spectrum. Below are five waypoints along the continuum to enable you to plot your positon along the continuum and to provide guidance to identify the techniques and to execute the strategies to make continual process along the continuum. Waypoint 3 - Defined Processes: Work activities are beginning to be viewed from a business process workflow – not only within a business function, but across business functions and in some cases across the enterprise. Markers of Waypoint 3 include: Conversion of text documentation to process maps; consistent repeatable execution of processes and supporting procedures; Best practices not yet identified and integrated into the processes; Processes remain relatively silo-ed. Waypoint 4 - Managed Processes: Markers of Waypoint 4 include: Processes and supporting technology are proactively managed from a cross-enterprise perspective; Processes are managed based on metrics and key performance indicators; Variation in Processes are identified and distilled into best practices; Legacy and non-value added business rules are identified and challenged; Process improvement remains informal – typically conducted as one-off projects. Waypoint 5 - Agile Processes: Business Process Improvement is managed as a Process. The key transition from Waypoint 4 (Managed Processes) to Waypoint 5 (Agile Processes) is making the shift from thinking about business process improvement as a one-off project to business process improvement as an on-going process. Markers of waypoint 5 include: Process improvement itself is a process; Horizontal improvement and optimization from a cross-enterprise perspective to maximize Business and Customer Value; Vertical improvement and optimization; Rapid identification of changes in internal and external variables; Proactively managing the backlog of opportunities. This post provides key concepts and best practice guidance on where your organization (or business functional area) is positioned along the Inteq’s Business Process Capability Continuum™, waypoints along the continuum and best practice guidance and tips regarding transition to the next waypoint. I encourage you to download the detailed 12-page whitepaper here, view the companion webinar and view the other whitepapers and webinars on our website. And, if you are ready to move forward with change in your origination, take a look at our training course offerings and our consulting services.